2013 witnessed one of the most robust real estate recoveries in history. 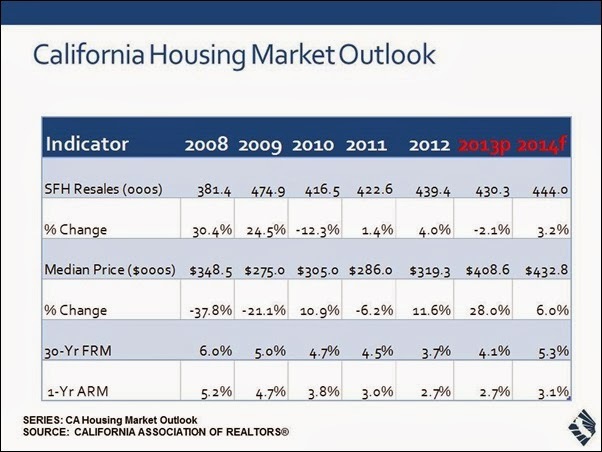 Home prices dramatically increased, fewer homeowners were underwater, and builder confidence was finally on the upswing. 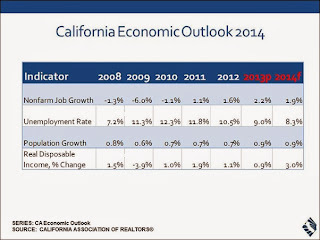 It appears as though 2014 could be another good year for housing. In general, we see interest rates rising, inventory growing, and a fewer number of homeowners struggling to make payments. Also, home prices could increase in the first half of 2014 as a result of pent up demand due to a lack of inventory at the end of 2013. We have made some predictions for the real estate market for the coming year. Many predict rates will hit 5% by the end of 2014–significantly up from the previous 3% levels. However, this is still well within normal levels. New Fed Reserve chief Janet Yellen is expected to continue Ben Bernanke’s policy of keeping mortgage rates low by buying blocks of mortgage-backed securities, but the Fed’s bond-buying taper could push rates higher. “While this will make homes more expensive to finance – the monthly payment on a $200,000 loan will rise by roughly $160 – it’s important to remember that mortgage rates in the 5 percent range are still very low,” says Erin Lantz, Zillow’s director of mortgages. Really. “Prior to the Federal Reserve’s 2008 decision to buy $85 billion in debt per month, the 36-year average was 9.2%, and never below 5.8%,” notes Glen Kelman, CEO of Redfin. 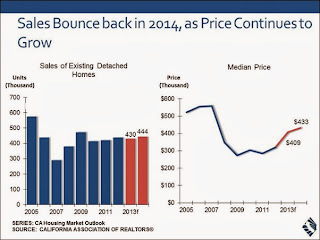 A severe lack of inventory drove rapid price increases at the beginning of 2013, but look for that to change in 2014. We noticed that the homes available for purchase shortage began to soften in February. New construction and rising prices should bring more homes, both new and old, on to the market in 2014, helping inventory return to traditional levels. The significant rise in home values helped 2.5 million homeowners with underwater mortgages regain positive equity status during the second quarter of 2013, according to Realtor.org. By Q3, a CoreLogic report found that about 6.4 million homes were still in negative equity at the end of Q3. Watch for that number to shrink in 2014. In 2014, Zillow predicts, home ownership rates will fall below 65 percent for the first time since 1995. “The housing bubble was fueled by easy lending standards and irrational expectations of home value appreciation, but it put a historically high number of American households – seven out of ten – in a home, if only temporarily,” says Humphries. “That home ownership level proved unsustainable and during the housing recession and recovery the home ownership rate has floated back down to a more normal level, and we expect it to break 65% for the first time since the mid-1990s.” Watch also for adult children to move out of their parents’ homes, starting their own households and further decreasing the overall home ownership rate. Rising prices, a reversal of underwater mortgages, and easier credit will free Americans up to move. But next time they’ll choose smaller homes in more affordable locations. Redfin is predicting that new lending regulations–which make it harder to borrow more–will send Americans to less expensive hubs like Portland, Denver, Austin, Richmond, Dallas, Houston, San Antonio, Atlanta, and Raleigh. The red hot foreclosure market has slowed, with September 2013 the 36th straight month of year-over-year decreases in foreclosure activity, nearly 33% down from the end of 2012. The declines should continue with the overall housing recovery. Despite the slower pace of price increases, home affordability will decline as mortgage rates rise. The real culprit is income levels, which aren’t keeping pace with the increases in housing costs. In 2013, the National Association of Realtors’ Home Affordability Index dropped to a five-year low. Experts predict the trend will continue in 2014. Amid the housing crisis, investors, not owner occupiers, bought as many as one out of every five homes in America, according to Redfin. The perfect storm of increased inventory, higher prices, and fewer foreclosures means that investors are stepping out of the buying market, giving way for regular single family buyers. This, coupled with easing credit requirements, and the housing buy market begins to look more normal. “All in all, more inventory, less competition from investors, and more mortgage credit should all make the buying process less frenzied than in 2013,” says Trulia. For more information about Palos Verdes Real Estate and South Bay or buying and selling a home on the Palos Verdes Peninsula, visit my website at http://pvbrokers.net . We provide specialized attention for all your real estate needs in the South Bay Los Angeles and the Palos Verdes Peninsula. We would love to hear your comments or suggestions. PV Brokers provides residential real estate services in the Los Angeles County South Bay communities of Palos Verdes Estates, Palos Verdes Peninsula, Rancho Palos Verdes, Rolling Hills Estates, Rolling Hills, Redondo Beach, Hermosa Beach, Manhattan Beach, Torrance and San Pedro. As a boutique Realty, our Palos Verdes Real Estate agents and palos verdes brokers are committed to giving our clients specialized service and attention. For more information on Palos Verdes real estate, palos verdes homes for sale, palos verdes foreclosures, homes for sale in Palos Verdes, palos verdes market information in addition to quality information on homes for sale, visit www.pvbrokers.net .